The Sinking of the "Spalpeen"
It was just dusk as I went on deck for a final look about before putting up the riding light and going below to start supper. There was no question about the weather, a cold raw November evening with the breeze steadily freshening out of the northeast. Low ragged gray clouds scudded across the sky bringing with them a stinging rain. Yes, we were dragging our anchor in spite of all the scope we had out and a lee shore only about twenty yards off our stern. Here we were well up in Plum Island Sound in a northeaster, it was getting dark and our anchor would not take hold on the hard smooth bottom under us. After a hurried consultation we decided to try and get out of the sound and into Lobster Cove at Annisquam before it blew harder and got too dark. The engine was started, the anchor raised and we began threading our way out through the winding channel. Before long it was pitch dark, but we managed to reach the entrance to the sound only scraping the bottom twice on the way. Here the channel is about 200 yards wide running between the beach and a long spit for nearly a mile before turning out through a narrow pass into Ipswich Bay. We proceeded along what we believed to be mid-channel when suddenly we were stuck on the sandy beach. It was so dark at this time that we could not see nothing until right on top of the beach. It being low water the outer sand bars acted as breakwaters so that at this time there was no sea breaking on the beach which we might otherwise have been able to see. Immediately and anchor was run out, but an attempt to kedge the vessel off proved futile and as the tide was still on the ebb we were soon left high and dry. Fortunately, there was a light on the beach about half a mile away. We stumbled towards this through the driving rain and came to a house among the sand dunes and from here telephoned the Plum Id. Coast Guard Station. They promised to come down at high water (about three o'clock the next morning) and try to tow us off the beach. On returning to the "Spalpeen" we found the local news hawk awaiting us for a story. It appeared that he had heard of our plight through the coast guard station and had dashed down to score a scoop. After plying him liberally with whiskey he finally departed with the promise of a fine write up in the "Lynn Daily Bugle" or some such paper. We then set the alarm clock for three the following morning and turned in as best we could with the boat lying well over on her side. After several hours of vainly trying to sleep in the midst of a mass of cushions, boots an oil skins, we heard the seas commencing to slap against the hull but this gave way to the heavy pounding as the tide came up over the bar outside and allowed those northeast seas to roll on in and break over us. Finally, we saw a light appear far up the sound and before long the coast guard boat was laying off our stern outside the breakers which by now were roaring in and breaking over the whole vessel making it impossible to stay on deck without clinging to the rigging. Somehow we managed to get a line to their surf boat and soon we had a hawser made fast to our mainmast. However, all this proved useless as their boatcould not possibly move us against the seas and was bobbing around with here propeller out of the water most of the time. After parting their hawser several times and working until five in the morning we had to give up. It was getting colder and we were soaked to the skin in spite of being will moused up in oil skins so we joined the coast guard boat by walking a mile or so up the beach inside the sound where there was less sea running and returned to their station for a bit of sleep and some food. 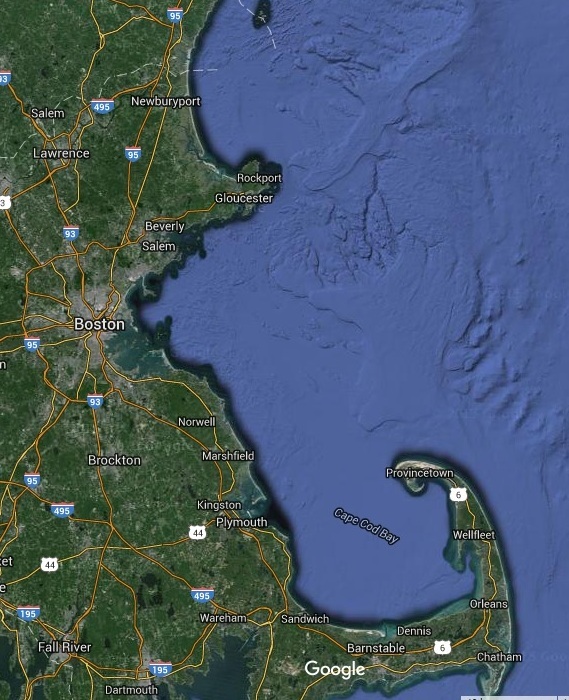 The Gloucester and Newburyport coast guard stations were contacted the next morning and at high water their vessels got lines on "Spalpeen" and started out to sea. For more than an hour every attempt to float her failed. the gallows frame was smashed away and it seemed as though she must be smashed to bits by these heavy breakers which continued to pile over her smothering everything in a mass of foam and green water. At last she began to move very slowly at first then suddenly she slid off the beach into the breakers as she headed into the channel. We piled into the surf boat and pulled out through the breakers and soon were aboard "Spalpeen" congratulating ourselves on getting her afloat at least with really no serious damage. Little did we realize that our troubles were far from over and that the worst lay head of us! There appeared to be about four inches of water over the floor boards in the main cabin and as this did not seem to increase we decided to tow her back to Gloucester and have her hauled out. Once outside in the numerous sand bars in Ipswich Bay we ran into a heavy following sea which forced a certain amount of water up through the rudder post hole. Water was soon coming in faster than we could bale and it was evident that she must have started a some of her plank while lying on the beach being pounded by those heavy seas. Now, it became a question of reaching shore before she filled up and sank. There was no doubt about our being in a rather precarious position although we were on the end of a long coast guard two line. The seas were getting larger, soon it would be dark and the cabin was already waist deep in water; if only we could reach shore in time! I was at the wheel standing in the cockpit up to my knees in water. Often I found myself having to hang on to the wheel to keep from being washed away as a big following sea would completely cover the whole stern with several feet of water. Hepburn had collected our guns and valuables piling them forward on the deck where we could get them off if she went down. The coast guard realized it was a race against time to save the schooner. they were doing their best to get us on a beach. Meanwhile, Andy had succeeded in launching the render. He had loaded our gear aboard, when suddenly her stern settled and down she started. I scrambled into the tender and managed to keep her stern to the following seas so she would not swamped while Hepburn splashed aboard. Suddenly, the tender for no apparent reason started to follow the "Spalpeen" to Davy Jones's locker. We saw the painter had fouled the schooners rigging. It was a question of seconds before we would be in the water too which did not particularly appeal to us as we were all bundled up in keg boots, oilers and heavy clothes. We had neglected to put on our life belts. I managed to get out my knife and cut the painter just in time to keep the tender from filling. In the meantime the coast guard had cut their towline and had turned around to pick us up. Once alongside us, we managed to get aboard by grabbing his rail as he rolled his rails down in the steep short seas. The "Spalpeen" had gone down about 25 yards west of the Annisquam Light in six fathom of water with just the trucks of the masts still showing. Three minutes more and we could have beached her in shoal waters and saved her. Such is the fate of one who tempts the sea! After spending the night at the Gloucester coast guard station, I started the problem of raising the schooner. Nowhere in Gloucester could I find anyone who had the proper gear or who was willing to undertake the job. The local waterfront opinion was that it could not be done and that I would be forced to abandon '"Spalpeen" for the coast guard to blow up to clear the entrance to the canal. I had a plan of getting slings from pontoons or barges under the hull at low water and then by lifting her with each tide we might be able to get the necessary gear or assistance here in Gloucester so I stepped into an office on one of the docks to telephone Boston. In the midst of my conversation I was interrupted by a large genial looking fellow who informed me that he knew of just the man to help me. In less than ten minutes I was bound up the canal aboard the able fisherman and workboat "Anna F. Clark", Captain Ephiram Clark, owner and skipper. After an hour and one half's work everything was in readiness and we waited for the tide to do the rest. At high water we were able to move her about 50 yards upstream before she grounded. We had to unbend our lifting gear and await low water which would give us our next opportunity to make fast and lift her once more. For five days we repeated this process on every tide but making very slow at first. On the fifth night we managed to lift the schooner and carry her well up inside the canal where we beached heron a well sheltered sand bar. At last we had moved her to a spot where no northeast storm could pound the boat to pieces. To move the boat we steamed very slowly up the canal with a tender out ahead sounding the channel as we proceeded. As we drew 18' of water and the chart showed three fathoms, we considered ourselves more than lucky in getting into the sheltered waters. A heavy blow came on the following day in which a Gloucester fishing schooner was lost with all hands. Had "Spalpeen" been out in the mouth of the canal during this weather, it is certain that she would have been pounded to pieces! Once we had succeeded in beaching her it was a simple matter to caulk the seams of the sprung plank, bale the water out, refloat her, and tow her to Boston where she was hauled out for the win winter. Naturally everything on board was a terrible mess and a good many things were ruined, but considering what the vessel had been through and where she went down I feel that we were very fortunate in being to get her up which we never could have been accomplished had it not been for those five fine days! "The 'Spalpeen' After Going Ashore on Ipswich Beach, Met Her Doom Almost in Sight Of Port"
The 36' auxiliary sch. yacht Spalpeen with two men aboard, under tow by the Coast Guard, filled and sank a stone's throw from the Annisquam light at the river entrance about five o/clock yesterday afternoon after her crew had leapt for safety to a small boat they had tied astern. The spars of the small schooner were all of eight feet out of the water, and efforts are being made today to secure a lighter to raise her. "The Dolliver's Neck life saving station motor lifeboat with Chief Boatswain George Joseph in command was towing Spalpeen to this port for repairs after having dislodged her from Castle Beach, Ipswich, where she had gone ashore Wednesday evening. Horace W. Fuller of 376 Randolph Avenue, Milton, the owner, and his friend, Andrew Hepburn of Concord, were aboard of Spalpeen., planning a hunting trip in this section for the week-end, when the craft went ashore on Castle beach. 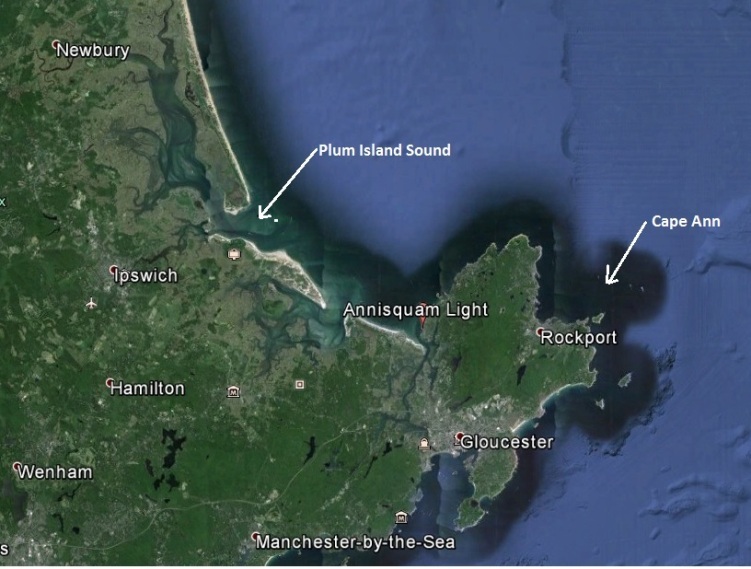 Aid was summoned from the Plum island, Merrimac and Dolliver's Neck life stations. The local Coast Guard including Chief George Joseph, Boatswain Arthur L. Olson, Surfmen James T. Wallace and Ernest Wilmoth, aided by a picket boat from Merrimac station succeeded in releasing the Spalpeen late yesterday afternoon. Fuller wanted to come to this port for repairs and Chief Joseph obliged him by towing the craft across the bay. It is believed that during her hours on the beach, the caulking had come loosened, opening her up. they noted that she leaked considerably all the way from the beach and were planning to beach her again on Annisquam beach, when a mile from her goal, she took on water so fast, that the tow-line had to be cut. Both men jumped in the dory and rowed to the lifeboat to resume the rest of the journey minus their schooner."